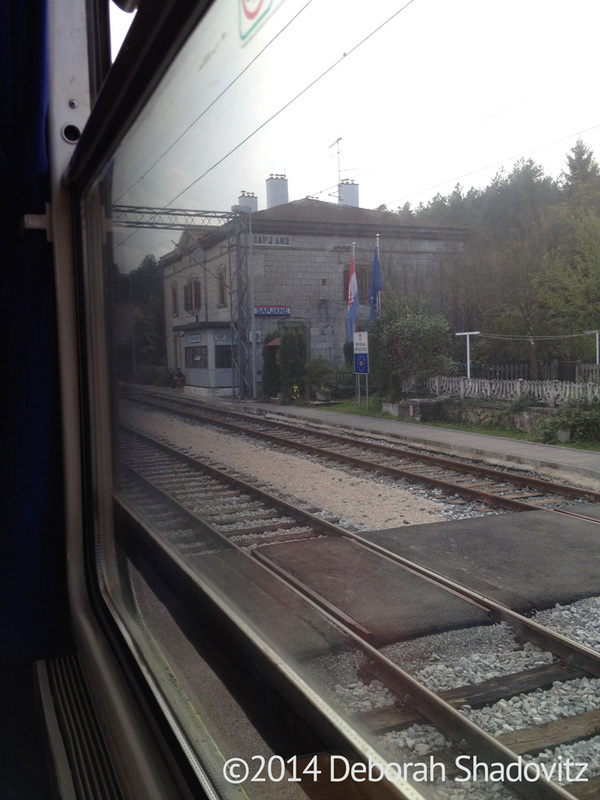 I am writing this as I sit, alone, in a six-person compartment on the 3:10 train from the Ljubljana (Slovenia) railway station to the Rijeka (Croatia) train station. As I entered the first available train car, the back-most car, I was at first taken aback and disappointed by the car full of 6-seat compartments. The separate compartments can be nice, but I was disappointed because I’d hoped to meet people on the train. I’d met my Ljubljana friends on a train. This is the first train of my 2014 trip. Walking out of my friends’ door, I carried my backpack, strapped to the wheel cart I’d purchased in Munich, by the backpack’s side handle to get it down the two flights of stairs. (Goran had carried it up for me.) Turning my body to the left and putting it down, I wheeled down their street toward the Dragon Bridge. As I turned left toward the train instead of right toward the marketplace and old town, I turned for a last glimpse of Gregor’s favorite skateboard shop, Oddesy, just because. Then I walked straight up the road to the building that’s next to the station, turned left and passed that one building bit before turning right and into the train station’s doors. At 2:37 p.m. I purchased my train ticket, €17. I had some time to sit and have a lunch. There’s a McDonalds in the station so, as rare and unusual as it is for me, I purchased a burger and small fries there. €1.50. Then I visited the station’s restroom. It was free and there was no one to tip. (But it was very clean.) Then it was time to board the train. I closed my eyes for 39 minutes but didn’t really sleep, or did I? My alarm is set for one hour just in case. I don’t know when we arrive or what time we cross the border – and I MUST get seen and stamped by the border guard. Or is that my entrance into Croatia? There was only the one Official. A nice man, great looking, young, friendly, good English. “I’ll try to,” he replied, and he positioned it perfectly and stamped slowly and precisely for me. He moved to the next compartment and then the next rail car. Then the train proceeded slowly down a bit of track and I awaited the next stop — an entry check. But the train sped up. That was it. It’s 5:08 and we haven’t had another stop. We did go through a tunnel, though. A really long pitch-black tunnel. No lights came on in the train’s hall or compartments. Pitch black. It was our second tunnel. The first was over 30 minutes ago. These tunnels felt like the mystery movie type where a “switcheroo” happens or something or someone goes missing, only nothing went missing — that I know of. We did have an incoming immigration control. Now I am officially in Croatia! My 90 days in Schengen are over. This immigration control person was a slim youngish woman in a blue uniform. I was standing in the hallway getting my passport out when she entered the rail car and I asked, “are you immigration?” She stamped under the exit visa. Perfect. Now that page shows me leaving Panama, entering Berlin Tegal Airport, exiting Slovenia and entering Croatia. I love it when my passport shows my travels properly. But wow, just one page for so much time. Once upon a time there would have been pages of stamps for my time between Berlin and Slovenia. We were stopped at that station or control point a long time, even after the woman got into her Police Car and drive away. Mechanics were talking up front for the last part. I was alone in my 6-seat train compartment the entire trip but a man had sat down in the compartment next door. Occasionally, perhaps four times, I’d stood at his compartment’s door and asked him questions. It started to rain just as we stepped onto the train platform. I didn’t even get to learn whether that hostel — or the town — was a road to the left of the right. I raced for the shelter of the very empty, closed train station and reached it just as it poured. Under the shelter, I donned my yellow poncho. I started walking from the train station, gambling that my intuition to turn right was the correct decision. It was. I think. How frustrating it was that the weather had been perfect for my entire train ride and now that I needed to find my way through a strange city and find accommodation, I’d be doing it in the very inconvenient rain, shlepping my too-stuffed backpack along puddle-filled roads. First, I walked empty streets. Then I got to some shops. I asked anyone I passed if they know a hostel. Most people just gave me a look and ignored me. Maybe they don’t speak English. I stopped in a pizza shop and asked but the people didn’t know of a hostel — or didn’t care to try to help me. I walked, starting to feel despondent. Please, g-d, I asked. Help me get out of this pouring rain, help me find a place to sleep and get warm, and maybe send me some nice people to travel with because it’s not going to be easy to see Croatia’s beautiful coast by bus while laden with this backpack. Finally, but oddly soon after I asked for this, two nice college-age girls stopped. One was a little bit comfortable speaking to me. She then spoke with her friend, turned back to me and said she would take me until we found one — and she did! She got me to an old, of course, building. Looking at the widely spiraled staircase and many stairs, she told me to wait. She was so kind to go up and check out the hostel for me so I didn’t have to carry my pack and wheels up in vain. I was in luck! (And so was she.) It was a hostel. I went up, blistering my wet hands as I carried my backpack on its wheels. As I started check-in the nice young woman and I said goodbye and she went to join her friend at her intended destination. I was relieved to be in a warm dry place for the night. Hostel Rijeka was home for the night. It was very clean and although 19€ (as I recall) which was pricier than I’d wished, I was happy to be there. Passing the kitchen, I noticed bread and coffee awaited. That would soon be very welcome. But first I needed to set myself up in the dorm. There were 6-8 bunk bed structures in the dorm but the room was large so we all had sufficient space and everyone had a locker. As I pulled essentials out of my backpack I realized how thoroughly it was soaked. Fortunately, the clothing, which was in plastic, wasn’t all soaked. At the suggestion of another guest, who also noticed, I took everything out of my pack and put it into the locker so my pack could dry. I hung much over my bed as well. Later that night, a couple of Spanish and English-speaking guys came into the other dorm. We talked. They were Yoel and Mariano. Later Mariano sat beside me in the kitchen and as we warmed up with a hot drink, he said they have a rental car. I asked if I could join them. Mariano and Yoel turned my Croatia trip. The next day I left with them and for all the days of my stay in Croatia, we traveled together.